A 77-year-old woman was left seriously injured after a lorry and car collided on Monday afternoon (July 18). Police said the collision took place outside the George and Dragon pub on the B2139 in Houghton, between Whiteways Lodge roundabout and Amberley, at 3.20pm. The woman, who was driving the car, was taken to Southampton General Hospital with serious injuries. No-one else was reported to be injured, police added. The road was closed and drivers were advised to avoid the area until further notice. 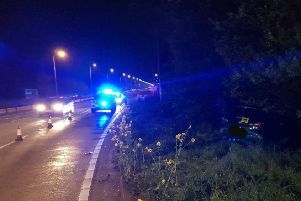 Anyone who saw what happened is asked to contact Sussex Police via collision.appeal@sussex.pnn.police.uk or call 101, quoting Operation Sedgebrook. Sussex Police had initially said the injured woman was 79 but in an update say she is in fact 77.